No matter how great your soft synths are there will come a time when you really want to match patch A from synth 1 with patch B on synth 2. In addition, you want to play them both at the same time and hear to the synths simultaneously. This is very easy to do. In this example, we will create a simple layer with two instances of Dimension LE. Keep in mind that you can use any soft synths and get the same results. The techniques used here will work on SONAR 8 or higher and SONAR Home Studio 7. The first step is to insert two Dimension LE soft synths into the synth rack each with an instrument track (or broken apart). Once they are inserted pick your two patches. 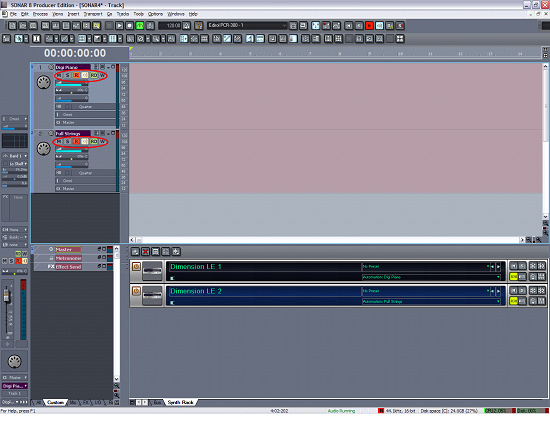 In this example we will use patches Digi Piano and Full Strings from Dimension LE . desired sounds loaded up your project should look like this. Now that the synths are loaded and have the right sounds we are almost done. All we need to do is tell SONAR that we want to trigger more than track (and synth) at the same time. To do this simply click on the Input Echo button until it turns yellow and then hold down the Shift key while doing the same action on the other track. You might be wondering what is Input Echo. Input Echo will take incoming MIDI Data (on MIDI Tracks) and/or incoming audio (on audio tacks) and pass the information through SONAR. This means if you have Input Echo enabled on a MIDI track routed to a soft synth you will hear the synth when you play your controller. If you have Input echo enabled on an audio track you will hear the audio signal, plus any effects toured through SONAR and back out your audio device. If you want to record to both of the tracks just arm them both by pressing the R button. Finally, make sure your MIDI input is set correctly on both tracks and you are done! Input Echo button and they are both armed by pressing the R key. 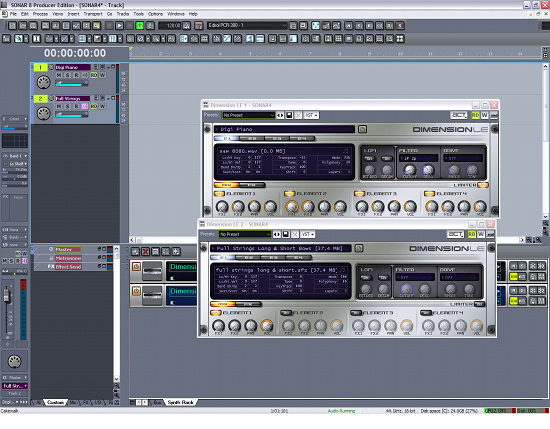 Try experimenting with different combinations of synths, patches and effects. You will quickly come up with a new library of exciting new sounds. Remember to save each combination as a Track Template so you can quickly recall the synth-combo in any project.